The Third Edition integrates essential topics more effectively than any text on the market, covering core concepts in each discipline in just 12 comprehensive chapters. Practical connections and applications show readers how to use their understanding of chemistry in everyday life and future health professions. With an emphasis on problem solving and critical thinking, the book promotes active and attentive learning, which now include NEW! media assets, Practicing the Concepts. 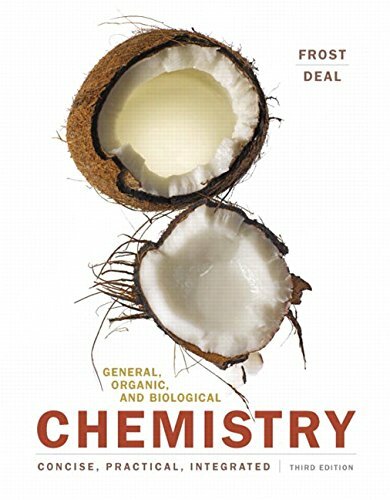 Featuring coauthor Todd Deal, these 3 to 5 minute videosexplorekeyconceptsin general, organic, and biological chemistry that readers traditionally find difficult.Readers gain skills and deepen their knowledge as they watch the videos and then practice what they have learned with Pause & Predict problems and a series of follow upmultiple-choice questions. This title is also available with MasteringChemistry — anonline homework, tutorial, and assessment system, designed to improve results by engaging students before, during, and after class with powerful content. Instructors ensure students arrive ready to learn by assigning educationally effective content before class, and encourage critical thinking and retention with in-class resources such as Learning Catalytics™. Students can further master concepts after class through traditional and adaptive homework assignments that provide hints and answer-specific feedback. The Mastering gradebook records scores for all automatically graded assignments in one place, while diagnostic tools give instructors access to rich data to assess student understanding and misconceptions.